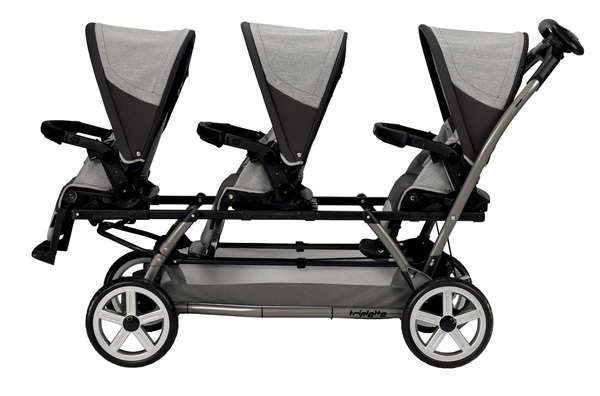 The Peg Perego Triplette SW Stroller is one of the few tandem strollers where seats can either face where the stroller is headed or who is pushing it. The stroller is designed to handle your kids from the day they’re born and it offers multiple reclining positions to make sure everyone is comfy. It’s a bit more expensive than other strollers on the list, but some reviewers believe they’re getting what they pay for. That’s pretty big and your space needs grow because, to collapse it, you’ll have to remove the three seats inside the stroller. Each seat is about the size of a normal car seat, so it’s going to take up most of your storage. 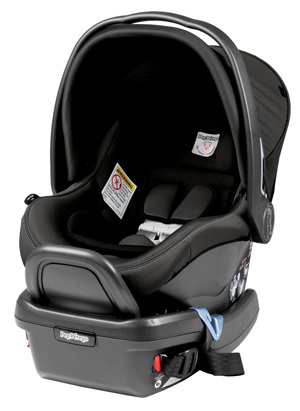 You can change out the stroller seats for car seats, but that requires you to have a big love of the Peg Perego brand. 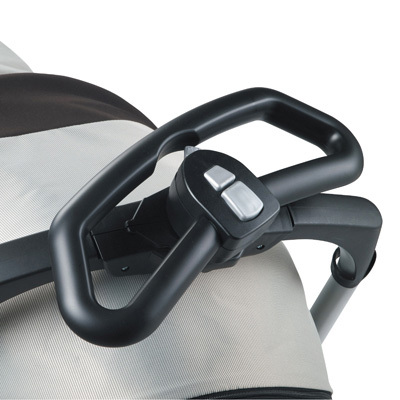 The “G-Matic System” allows for the Primo Viaggio Infant Car Seat to attach directly to the stroller chassis without adapters, making it easier to move your baby from the car to the stroller when you’re on the go. Its car seat setup is good and bad. You’re not fussing with a lot of adjustments, making the move easier on everyone. However, Peg Perego says that you’ll need to use its Primo Viaggio 4-35 seats and that no others are support in the Triplette. The company sells these online for $280 each, so the cost can get a little rough as well. 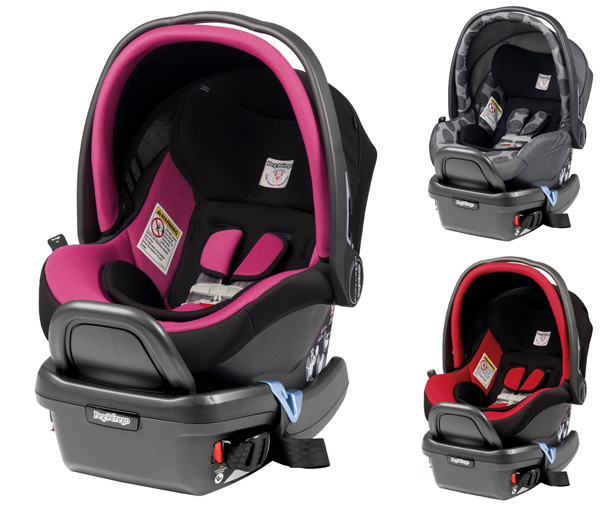 While the Triplette can handle up to three infant seats, that’ll set you back $840 if you don’t already own them. That means it’s roughly a $1,600 investment when you factor in shipping and any accessories. This is a great solution to save money. 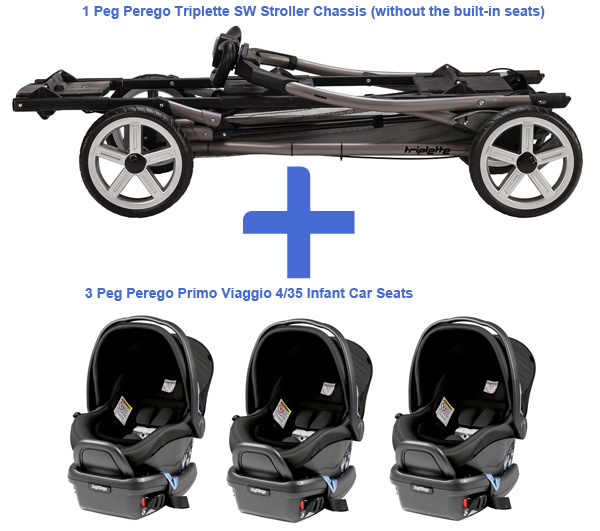 Instead of getting the full Peg Perego triplette SW stroller, get only the stroller chassis along with three Primo Viaggio 4/35 infant car seats. Much cheaper! The Primo Viaggio 4-35 seats comes in many different colors and designs. What’s nice about the seating, whether you stay with the built-in or add those car seats, is that everyone gets an individual hood that you can look through and check to make sure the ride is going well. The hood has a spot for you to hang a toy, so everyone can have their favorite bear, lion, doll or whomever along for the ride. The seats come with three different reclining options plus footrests that have two positions, so there’s a good variety to make sure everyone has the comfort they need. 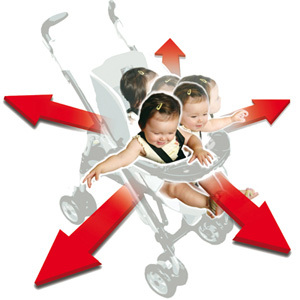 Seats use a “Freedom of Movement” harness which is essentially a five-point harness that allows everyone a little wiggling but won’t let anyone fall out of the stroller. 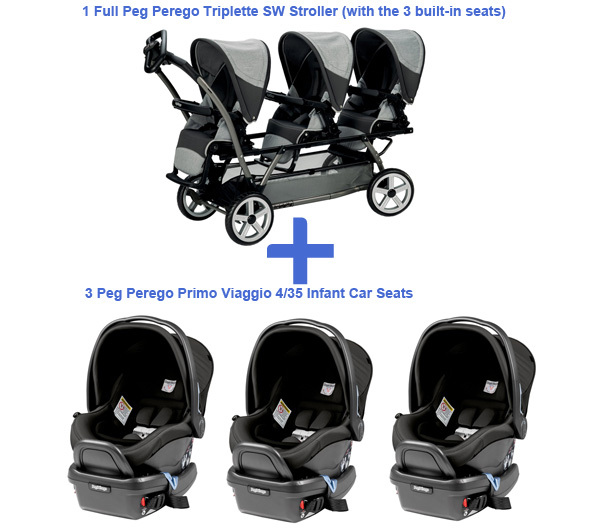 You can use any combination of the regular seats and Primo Viaggio 4-35 infant seats. This can be helpful to add a little separation by putting the car seat in the middle. The handle is a single, solid piece that allows for easy pushing when you’re walking around. The design is comfortable and means you only need to use one hand, but it isn’t the best for jogging. Steering comes with a moveable wheel, so it’s just like driving a car. That can be a big help for days when have to juggle multiple things or if you’re trying to maneuver around a narrow space in front of a cashier. 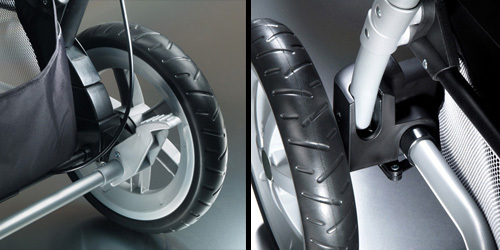 Users aren’t always happy with the length but they do like its ability to turn and maneuver. Rain Cover: Peg sells individual and whole-stroller rain covers that can help keep your babies dry and happy. 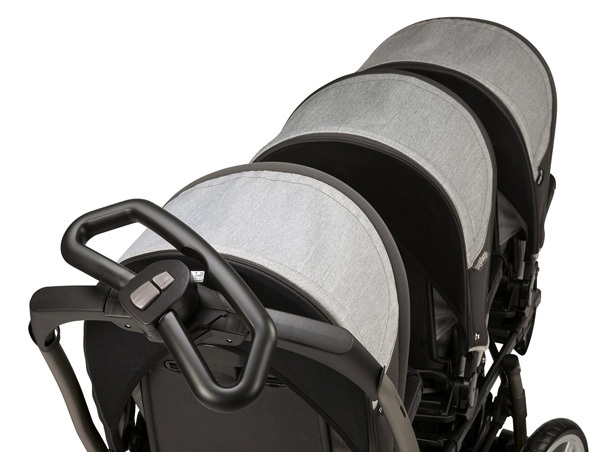 They fold up small and can easily fit in the very large basket you’ve got under the Peg Perego stroller. Mosquito Netting: These protectors fit snugly around the hood and foot of the stroller so they can keep pets away. It uses elastic but has enough mesh that no one is going to get overheated. Baby Cushion: these cushions add a layer of warmth and help smaller kids fit in the seats. They’re designed for Peg high chairs and strollers, so they’re interchangeable if you’re in a Peg Perego household. Stroller Cup Holder: The Stroller Cup holder stretches to keep the cup secure and prevent spills. It attaches close to the handle but won’t get in the way of the turning wheel. Car Seat Cup Holder: This holder will attach to the side of your car seat and allow for snack time. Some users say it doesn’t quite fit with the stroller, but others haven’t had any problems. Igloo: This adds a layer of warmth to your car seat and can zip up so everyone is comfy. 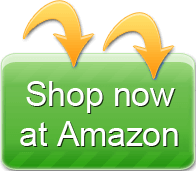 You can use this with the car seat both in the car and on the stroller. Cost can be an issue for you, because this stroller will set you back a bit. 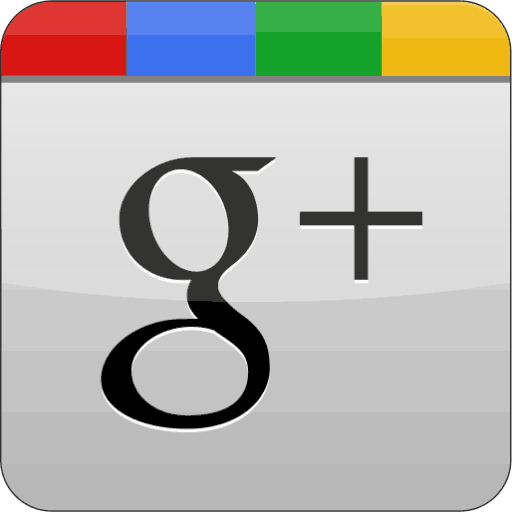 However, lots of reviewers find it to be worth that cost. There are some reports that the frame has had an issue, while other people say it’s lasted more than two years without a problem. The real issue is if you’ve got the space for it. This is a large, bulky stroller but it’s perfect for outings to the park because of its incredible large storage basket under everyone. There are a lot of great options to keep kids out of the sun or other elements, but remember this isn’t a jogging stroller so you’ll want to keep a steady pace. Peg Perego guarantees each of its new infant & toddler products to be free from defects for two years. Defects include materials and or workmanship problems and the warranty applies when purchased from Peg Perego or an authorized Peg Perego dealer. The basket is meant to hold light weight items such as blankets, a medium sized diaper bag and small things. This doesn’t replace a shopping cart. All Peg Perego strollers hold 45 lbs. per seat. The company lists a website for repairs, but don’t use it. Instead, call them directly at 1-800-671-1701. Peg Perego doesn’t sell products directly in the US, so you’ll have to use a third-party for any repairs or sales, including buying spare parts. Works well with Peg seats. Multiple seat options means support for a wide range of ages. Easy to move despite its weight. Turning radius is very wide. The size and need to remove seats means it’ll take up most or all of your storage space – it may not fit in your car, but it’s similar with most triple strollers. Basket is hard to access because of kids’ feet. We are not sure if it is a matter of improper use, but some parents reported durability issues: frame breaks and the steering wheel has also broken for a small number of users, so you might need to take extra caution with this stroller in case it’s not an improper use cases. 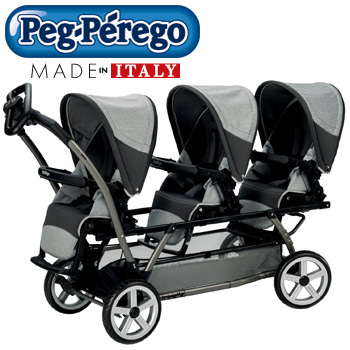 Peg Perego is an Italian company that’s been making baby products since 1949. 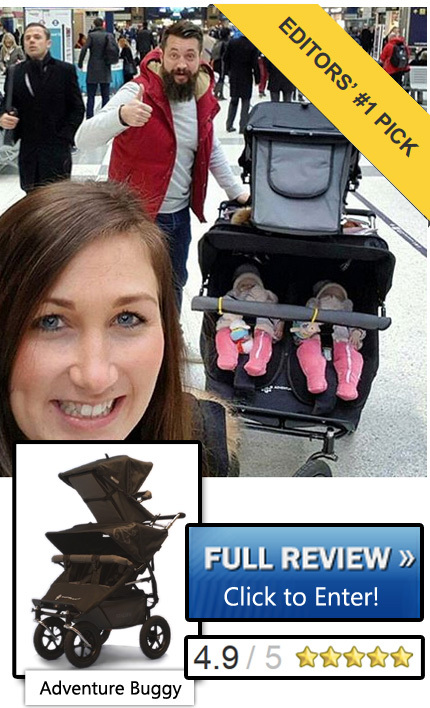 It offers a wide range of products and its strollers have a decent European fan base. The company doesn’t have many product recalls. Its last major recall was in 2012 and the company has changed its harness system to address that problem. 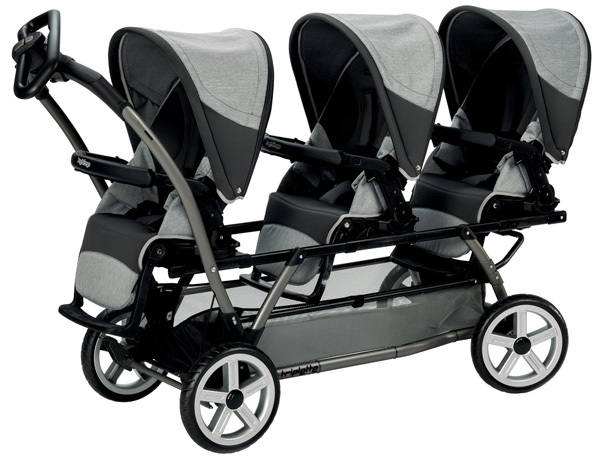 The Peg Perego Triplette SW Stroller is a good stroller for three if you’ve got the room. It’s big and bulky but handles well and allows for easy transporting of the little ones. We like it a lot simply because of the ability to mix and match seats plus change their direction. It may not be an everyday stroller because of its size but it doesn’t have many complaints over quality.